Get inspired to create a modern black and white kitchen of your dreams with these ideas. This project is sponsored by Jeffrey Court, FrogTape, Elkay, Liberty Hardware, and Lamps Plus. As always, all thoughts and opinions are my own. See my disclosure policy here for more information. Did you see our announcement last week? I’m so excited to be participating in Jeffrey Court’s Spring Renovation Challenge! We are tackling our dark kitchen and have already made so much progress! I can’t wait to show you everything we’ve done. In case you missed last week’s post on the before plans, here’s a quick recap of what we started with. You can read the full post plus watch a video walkthrough here. Now, for the design plans. This is my absolute favorite part of making over a space (besides when it’s done of course)! I love gathering all my ideas and putting it together to create a cohesive look. 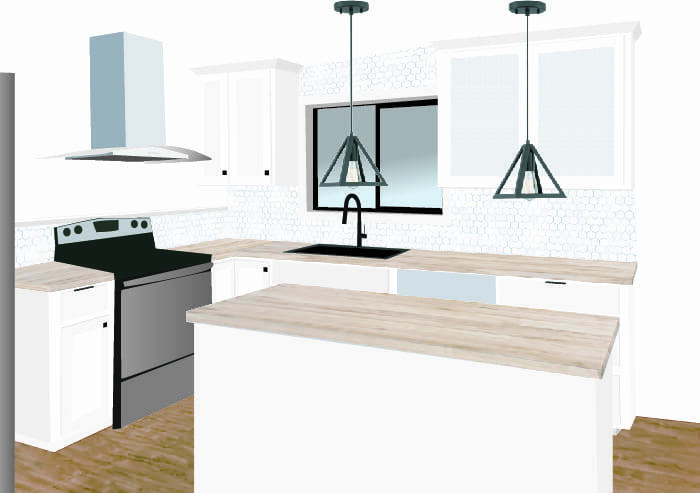 Here’s a mockup I created of what I imagine our kitchen will look like when we’re all done. Creating the digital image of the space was so helpful for me to be able to try out different light fixtures, tile designs, and countertops before committing to buying everything, because let’s be honest, there is nothing worse than thinking that you’ve found the perfect item for your space and realizing once it’s arrived that it’s not going to work out. Now, let me break it down for you with the big projects in the kitchen area. The dining room area isn’t getting a huge overhaul, but just some finishing touches to pull it all together. Here’s what’s on the agenda for the dining room. Next year, Justin and I celebrate our 10th anniversary (I think that calls for a fun trip, don’t you?) and let’s just say most of the stuff in our kitchen were wedding gifts. We got a lot of great stuff, but we’ve refined our style a lot over the last few years and it’s time for a change. I’ve spent hours online window shopping and gathering all my favorites together. I don’t want to give it all away, but here are some of the pieces I’ve found that will be in our black and white kitchen. Related: Limited on time or don’t want to drag little ones around the store? Check out my best online shopping tips for making successful purchases without seeing them in person. We’re going all in on the black and white look with clean lines and a minimalist feel. 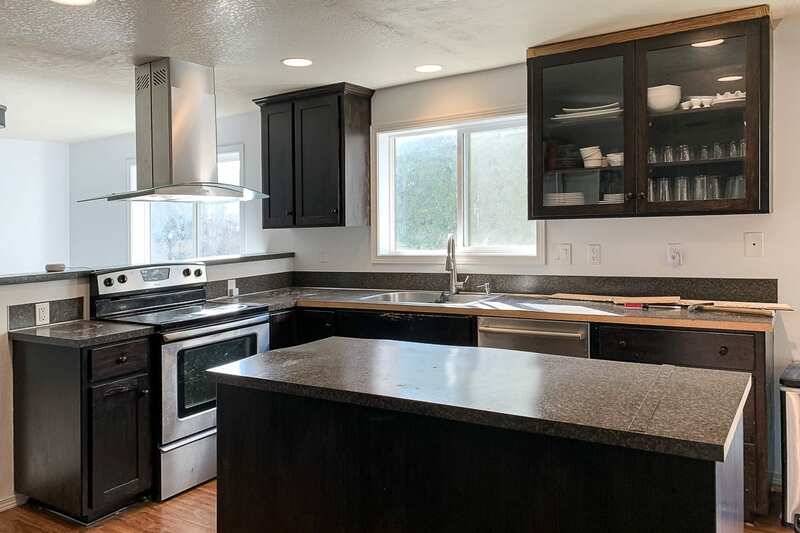 There is limited natural light in the kitchen so we’re going with a primarily white look with black accents and details. I’m also hoping to keep the counters completely cleared of clutter (thank you Marie Kondo), which is why we are replacing our armoire with this large industrial shelf from IKEA. The rug was a huge risk, but it just arrived in the mail this last week and I cannot wait to see it actually under our dining room table! This grey and black rug looks pretty plain at first glance, but what you don’t know is that it is made of all leather. Our dining room table used to be an office desk, but we moved it into the dining room a while back to get a little more space when our extended family comes over. It’s been nice to have, but isn’t the most functional for little ones. We’re going to refinish the table, remove the drawer, and fill all the cracks and holes so it doesn’t gather so many crumbs. Ready to see it all put together? 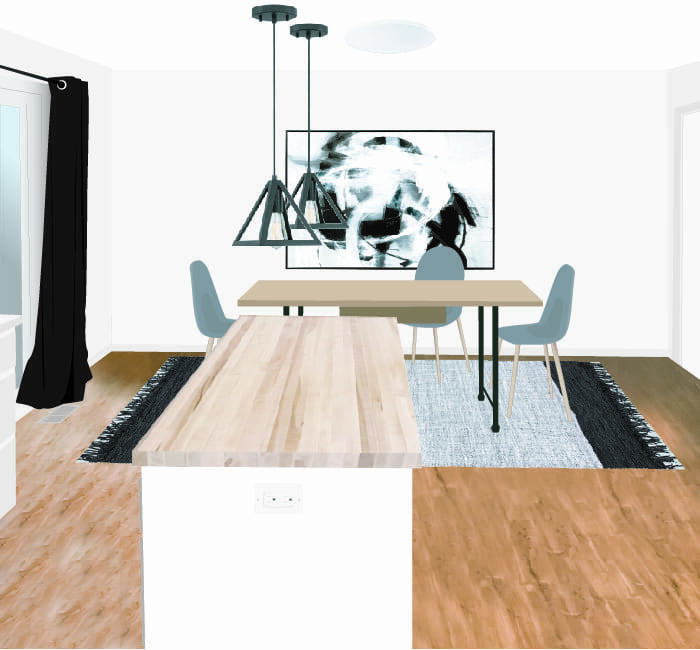 Here’s our mood board that I created for our kitchen makeover. 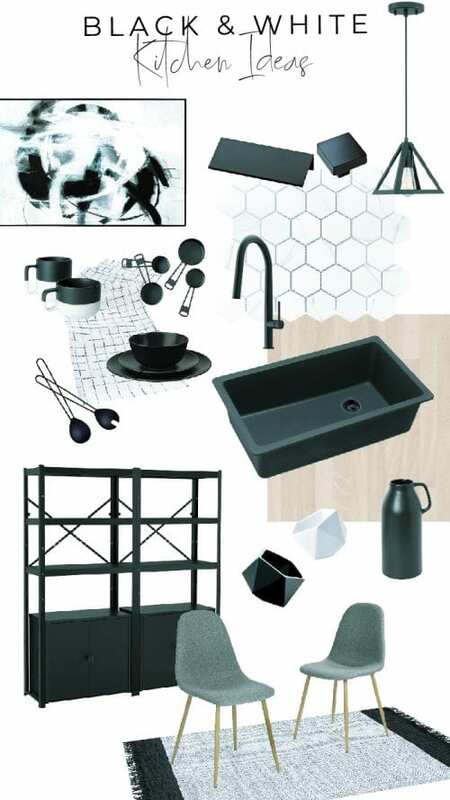 Click the links below the image to see where to get your own black and white kitchen accessories. First off, the tile! That hexagon marble mosaic is going to look amazing covering the back wall behind the sink and also the half wall behind the oven. I cannot wait to get it installed!! I have a major thing for hexagons—like this wood shelf, these coasters, these popsicle stick shelves, this string art, these candle holders, and about a thousand other projects I’ve DIY’d in our home— and also a real love for marble. I mean, who doesn’t love marble?! I couldn’t afford the real thing when we made over our powder room a few years back when we made a faux marble counter I shared here, so I’m excited to start getting tile up and how it elevates the feel of our kitchen. Another thing I can’t wait to see in the space is that black sink. Elkay sent us this gorgeous black quartz single-bowl sink and I imagine it’s going to be INCREDIBLE! We didn’t originally plan for a single bowl sink, but after spending a weekend in a beautiful airbnb in Waco with some of best girlfriends a few weeks ago, I got attached to a single bowl sink and we decided to just go for it. I’ll keep you posted once it’s installed! So, how are we doing on the official to-do list? Well, the cabinet paint got delayed in the mail so that didn’t arrive until Friday morning and then we were out of town over the weekend, so we didn’t get a ton done, but we’re definitely making progress. 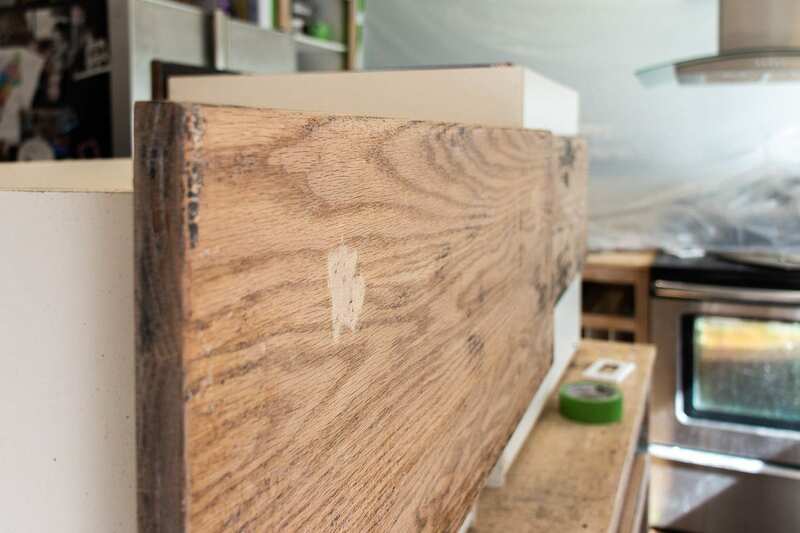 We are in the process of finishing off the sanding and filling all the holes on the drawers. We’re just about done with that so we’re going to be starting on the painting very soon. 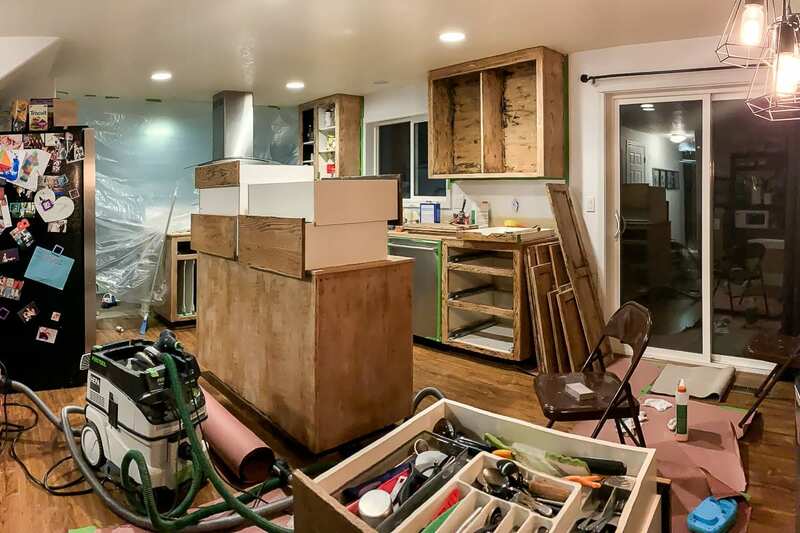 Here’s what the kitchen looks like as of last night. The last of the big items arrive in the mail this week so it’s exciting to see how everything will actually look in the space and start to come together now. Check out our weekly video update on the progress we’ve made, plus a guest appearance from my favorite little helpers and a super fun package that arrived this week! Have I mentioned renovating a common area in your home with little kiddos is tough?! We’ve found putting up a baby proof gate in the hallway at least slows the kids down from going in the kitchen and we put up a sheet of large plastic in the other entrance to distract them from going in on that side and to keep the dust out. Be sure to follow along on Instagram @acraftedpassion for daily updates on the progress we’re making! This weekend we plan to power through painting all the cabinets so that we can install the new countertops and sink next week.